Master/Slave link - 10 units max. 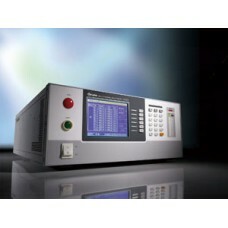 Hipot test is one of the major test items in electrical safety test. All electrical components and products including transformers, capacitors, power supplies, chargers and home appliances all require hipot test. With more than 20 years experience in developing the instruments for test and measurement, Chroma creates the 19020 multi-channel hipot tester with a brand new architecture. It can measure the hipot leakage current of all channels at the same time and conduct tests on 100 DUTs at most simultaneously. There is no need to purchase various Hipot testers to save the production line space if Chroma 19020 is in use. Its one time multi-channel test can increase the efficiency of electrical regulatory test. It improves the productivity and reduces the risk of test for the products that require hipot test only. Chroma 19020 also has powerful functions in Flashover detection and Open/Short Check. It contains several international patents and is the best tool for electrical regulatory hipot test as not only reliable quality can be obtained, highly efficient test platform can be created. Chroma 19020 has equipped with the world's first sync hipot test function that one single unit can perform 10 channels sync output and measurements simultaneously. Maximum 10 units (master & slave) can be controlled to have 100 channels in total. They can be grouped for output to avoid creating voltage difference due to adjacent tests as well as to improve the productivity.